In the first six months or so of 2018, I posted around 180 pictures which I had taken in London in to my London Photographs web site, and along with them made a daily post on my Facebook page with some details and comments on a newly added picture. But those comments are now hard to find, and I’ve begun to add them to the web pages. I’ll now also publish the pictures and the comments here on >Re:PHOTO, where they will remain easy to find in a series of posts with around 7 images at a time. On Facebook now, I’m publishing pictures I took in 1981 in the same way. London’s skyline is rather less clear now, and a picture from the same viewpoint would be dominated by The Shard, I think between the two tall blocks at right. 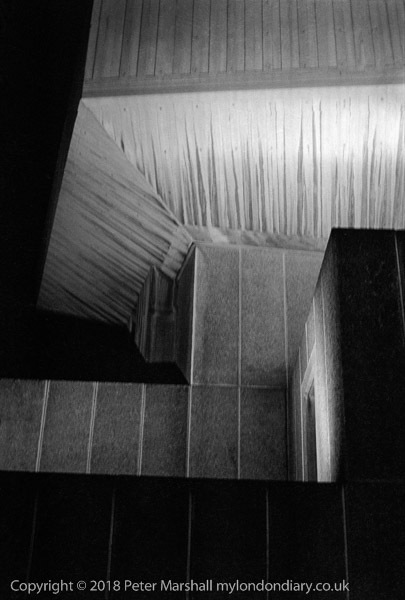 I’m not sure why I was wandering around the South Bank at night, but probably after an opening, perhaps at the Hayward or National Theatre, and of course I had a camera with me. I suspect it was the Leica M2, which is a purely mechanical camera and has no exposure metering. I had an accessory meter for it which slotted in and coupled with the shutter dial, the Leicameter MR, a curious battery-free CDS meter which was generally about as accurate as holding up a wet finger, but failed to give an reading at all in low light, and this, or perhaps a few glasses of white wine, accounts for the considerable underexposure. 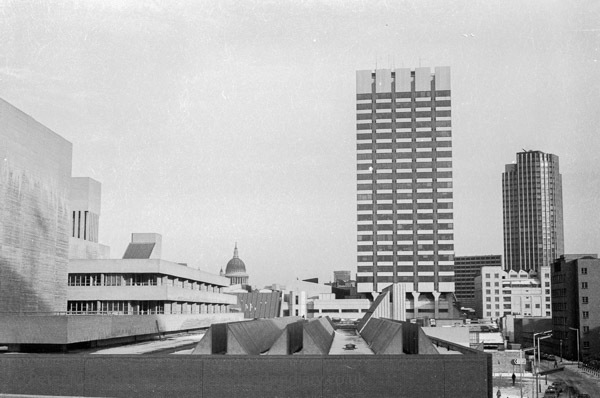 Although my caption states ‘National Theatre from Waterloo Bridge’, I think this is taken from the walkway at a lower level. The Beer Garden of the White Swan is a pleasant place to sit with a beer or two in Summer, but in January we had both snow and a little flooding. 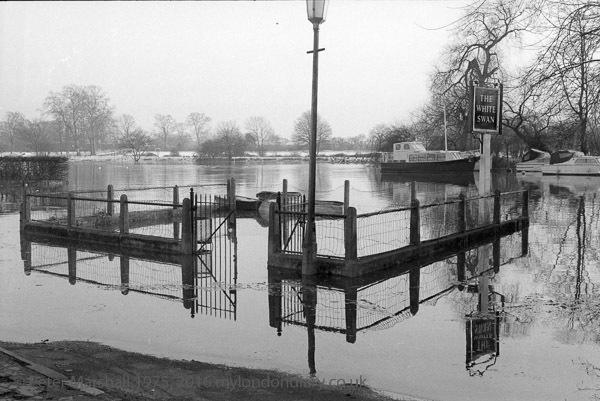 It isn’t unusual for the Thames to overflow its banks at high Spring tides onto Twickenham Riverside. The boats at right are moored by the downstream end of Eel Pie Island, with a rowing eight just making its way along the main stream beyond. Across the river at left is the road leading to Ham Street Car Park by the river, which helpfully has a notice warning motorists that it is liable to flooding, though not everyone bothers to read it – or to consult their tide tables. 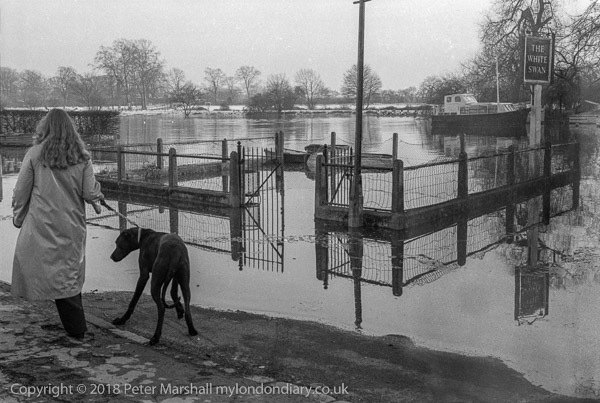 Another picture of the flooded beer garden with a woman walking her dog. We had a lot of snow in December 1978 and January 1979, enough on at least one day, together with icy roads to stop me getting to work, and some days when I and my colleague did struggle in it was to find few pupils had struggled into school with the day starting later than usual and finishing earlier to enable them to journey home while it was still light. I had extra time on my hands an spent quite a lot of it photographing snow, mainly in walking distance from where I lived, but also up in Derbyshire around Paul Hill’s Bradbourne Photographers’ Place and on a trip from there to Alton Towers. Unfortunately when I got home and developed those films I found my Leica M2 had developed a shutter fault, sticking slightly three quarters of the way across the frame, probably brought on by the cold weather, ruining most of my pictures and making a large hole in my pocket for the expensive repair needed. Though to be fair, it hasn’t needed another repair since I got it back later in January 1979. Fortunately I was also taking some pictures on my Olympus OM-1, which were fine. It wasn’t a weather-sealed camera, but didn’t seem to mind getting cold or wet, and on at least one occasion I’d removed the lens after being out in driving rain and literally (and I do mean literally) poured the water out. But I’ve never found snow appealing as a photographic subject. It covers everything with its overall gloop, removing subtlety. This is one of the few snow pictures I’ve ever shown or sold, taken on a walk from Twickenham to Richmond along the riverside. 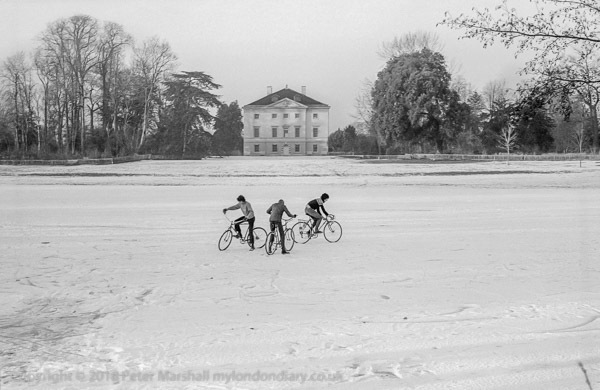 The snow forms as useful rather blank background for the three boys on bikes, who I’d stopped to photograph. In the first frame they were together in a group and there was another riding away near the right edge of the frame; it wasn’t a bad picture, but my second frame caught them just as the three were moving apart, those on each side of the group in opposite directions, their six wheel just still linked. This was made with the revived Leica, which is perhaps why I’ve never cropped the image though I think it would improve it to do so a little, though there is something attractive about the huge expanse of white nothing with that small group in near-silhouette at its centre. Taken on the same walk, this is a figure I photographed on several occasions, of which I think this is the best. Crudely drawn, something between a ghost and a human, it appeared to me as someone’s scary phobia emerging from this locked gate. Behind is the elegance of Orleans House, where I helped organise and took part in several exhibitions of our small photographic group. This entry was posted on Sunday, February 10th, 2019 at 09:32 am and is filed under LondonPhotos, My Own Work. You can follow any responses to this entry through the RSS 2.0 feed. You can leave a response, or trackback from your own site.